It is replaced by the Avery-Dennison Tabletop Printer 1 (ADTP1). 9855 is a Leading edge solution for warehouse or distribution inventory control, Supply chain management and logistics, Tracking, 9855 is specially designed to write to RFID chips embedded in thermal direct or thermal transfer barcode labels, The printer tests the chip, writes to the chip, Then prints the human readable and barcode data. 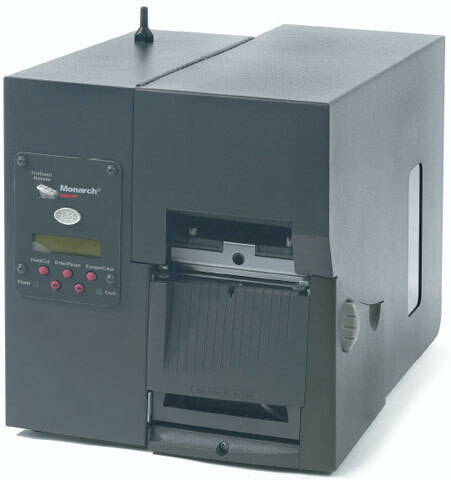 9855, Metal Cover, 300 dpi Printhead, Peel Option, Ethernet, RS-232 Serial, USB, and Parallel Interface, 4 MB Flash, 16 MB SDRAM, 150 MHz, 32 bit Processor. 9855, Metal Cover, 203 dpi Printhead, Verifier-Ready Option, RS-232 Serial, USB, and Parallel Interface, 4 MB Flash, 16 MB SDRAM, 150 MHz, 32 bit Processor. 9855, Plastic Cover, 203 dpi Printhead, Ethernet, RS-232 Serial, USB, and Parallel Interface, 4 MB Flash, 16 MB SDRAM, 150 MHz, 32 bit Processor. 9855, Plastic Cover, 203 dpi Printhead, Knife-Ready Option, RS-232 Serial, USB, and Parallel Interface, 4 MB Flash, 16 MB SDRAM, 150 MHz, 32 bit Processor. 9855, Plastic Cover, 203 dpi Printhead, Peel Option, RS-232 Serial, USB, and Parallel Interface, 4 MB Flash, 16 MB SDRAM, 150 MHz, 32 bit Processor.